Bananas are of the family Musaceae. Globally, bananas rank fourth after rice, wheat and maize in human consumption; they are grown in 130 countries worldwide, more than any other fruit crop. 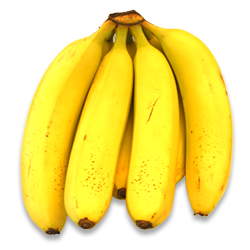 Bananas are native to tropical Southeastern Asia but are widely cultivated in tropical regions. In 15th and 16th century, Portuguese colonists started banana plantations in the Atlantic Islands, Brazil, and western Africa. As late as the Victorian Era, bananas were not widely known in Europe, although they were available via merchant trade. Virtually all bananas traded internationally are of a single variety, the Cavendish, the genetic roots of which lie in India. Three years ago, New Scientist revealed that the Cavendish crop was threatened by pandemics of diseases such as that caused by the black sigatoka fungus. 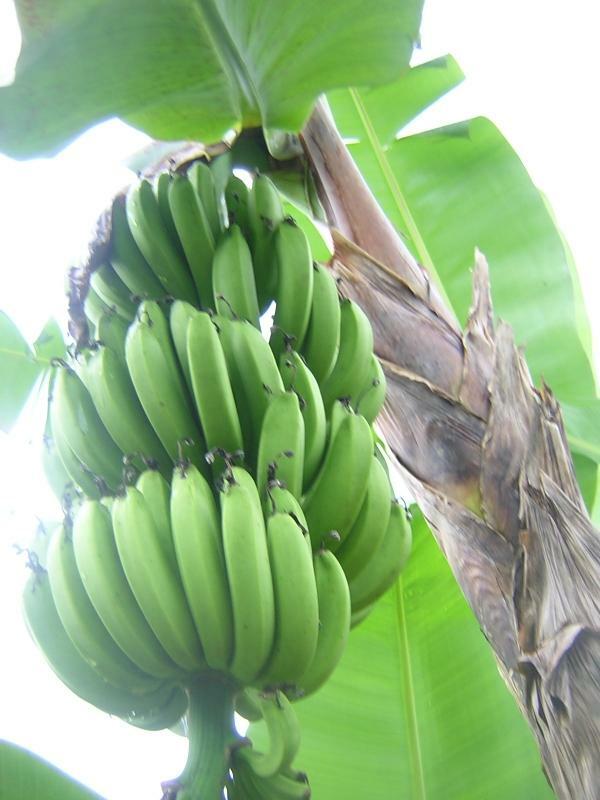 Now the UN Food and Agriculture Organization (FAO) has warned that wild banana species are rapidly becoming extinct as Indian forests are being destroyed, while many traditional farmers' varieties are also disappearing. It would take a global effort to save the bananas' gene pool. 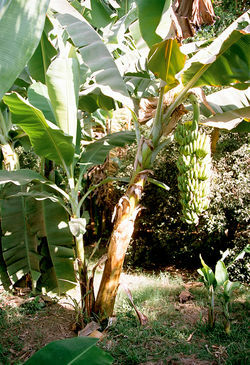 Bananas are fast-growing herbaceous perennials arising from underground rhizomes. The fleshy stalks or pseudostems formed by upright concentric layers of leaf sheaths constitute the functional trunk. 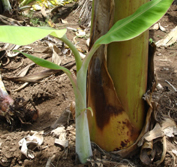 The true stem begins as an underground corm which grows upwards, pushing its way out through the centre of the stalk 10-15 months after planting, eventually producing the terminal inflorescence which will later bear the fruit. Each stalk produces one huge flower cluster and then dies. New stalks then grow from the rhizome. The large oblong or elliptic leaf blades are extensions of the sheaths of the pseudostem and are joined to them by fleshy, deeply grooved, short petioles. The leaves unfurl, as the plant grows, at the rate of one per week in warm weather, and extend upward and outward , becoming as much as 9 feet long and 2 feet wide. They may be entirely green, veins running from the mid-rib straight to the outer edge of the leaf. Even when the wind shreds the leaf, the veins are still able to function. Approximately 44 leaves will appear before the inflorescence emerge. 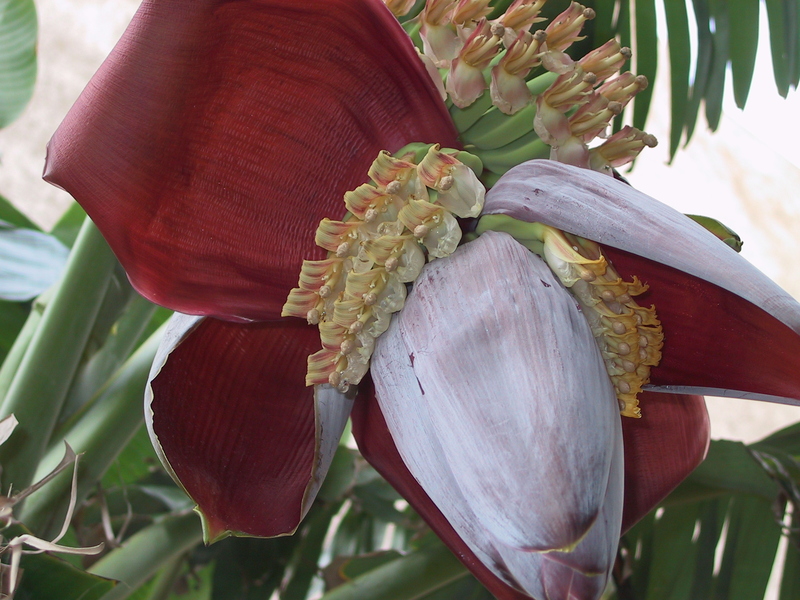 The banana inflorescence shooting out from the heart in the tip of the stem is at first a large, long-oval, tapering, purple-clad bud. As it opens, the slim, nectar-rich, tubular, toothed, white flowers appear. They are clustered in whorled double rows along the floral stalk, each cluster covered by a thick, waxy, hood like bract, purple outside and deep red within. The flowers occupying the first 5 - 15 rows are female. As the rachis of the inflorescence continues to elongate, sterile flowers with abortive male and female parts appear, followed by normal staminate ones with abortive ovaries. The two latter flower types eventually drop in most edible bananas. The ovaries contained in the first (female) flowers grow rapidly, developing parthenocarpically (without pollination) into clusters of fruits, called hands. The number of hands varies with the species and variety. The fruit (technically a berry) turns from deep green to yellow or red, and may range from 2 1/2 to 12 inches in length and 3/4 to 2 inches in width. The flesh, ivory-white to yellow or salmon-yellow colour, may be firm, astringent, even gummy with latex when unripe, turning tender and slippery, or soft and mellow or rather dry and mealy or starchy when ripe. The flavor may be mild and sweet or subacid with a distinct apple tone. The common cultivated types are generally seedless with just vestiges of ovules visible as brown specks. Occasionally, cross-pollination with wild types will result in a number of seeds in a normally seedless variety.